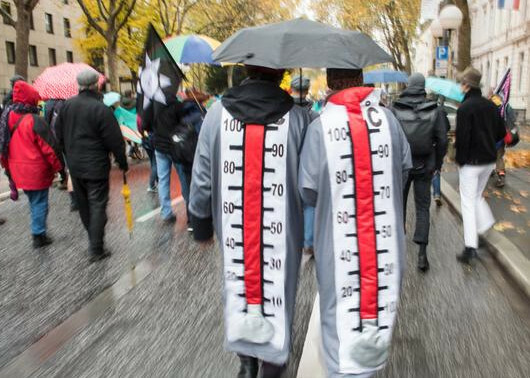 With anti-nuclear banners, polar bear costumes and Carnival-style floats, thousands of protesters took to the streets in Bonn to urge governments to do more to combat climate change. No Climate Change, the group leading the demonstration, said some 2,000 people from Germany and around the world marched from downtown Bonn toward the site where the COP23 climate conference is taking place near the United Nations headquarters. A subsequent climate protest took place in the city center. They both wanted to grab the attention of climate conference attendees gathered in the western German city. Thousands of delegates from over 190 countries are taking part in the Fiji-hosted conference, which runs until November 17. “We have to put pressure on politicians and negotiators at the COP so that they will make concrete targets and binding agreements,” said Paternoga over the sound of music and drums from the colorful anti-fossil fuel and nuclear protest. Parties to the Paris Agreement have set non-binding national targets to cut emissions and are now hammering out the details of how they can monitor and compare progress ahead of the COP24 conference, set to take place in Poland in 2018. If delegates fail to reach a decision, it will be difficult to keep global average warming under 2 degrees Celsius (35 degrees Fahrenheit), say observers. The protest kicked off in Bonn’s city center at 11:11 a.m. local time (10:11 UTC) to coincide with the start of the Carnival season celebrated mainly in western Germany. To mark the day, people don fancy dress costumes and party on the streets of cities like Cologne. 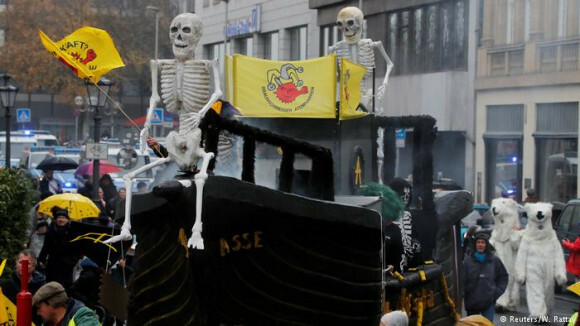 In another nod to Carnival celebrations, large floats accompanied the activists, including a ghost-pirate ship afloat on a sea of nuclear waste. Germany is set to shut all its nuclear power plants by 2022 but disputes remain over how to safely store the waste. Other countries, like India, want to use nuclear power alongside renewables as an alternative to fossil fuels. “There is a big fear that there are a lot of nations that want to fight climate change with nuclear power and we are here because we know what nuclear power does to the earth and to the people,” said attendee Martin Donat, who was dressed as a rusting barrel of nuclear waste. 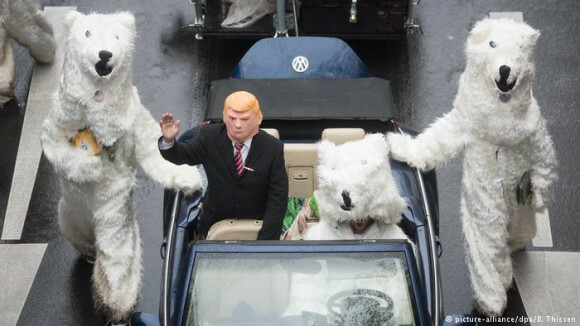 On one float, an activist dressed as US President Donald Trump was driven through the streets by a fleet of polar bears in a Volkswagen convertible — the German automaker has admitted to cheating on diesel emissions tests worldwide. A tipped-over, smoking model of the Statue of Liberty was dragged behind the troupe. Jens Galschiot, the art-activist from Denmark behind the float, said it was important for artists to represent what is going on in the world with climate change and to build a bridge between scientists and ordinary citizens. But Galschiot’s main criticism was aimed at Trump’s decision to pull the US out of the Paris Agreement. “Trump is perhaps most extremely saying we want to pollute, we want to consume. He doesn’t care about the whole world. This is the reason we have Trump with us,” Galschiot, who was dressed as a polar bear, told DW. COP 23 protesters show rising temperatures. Activists from countries like the Philippines and India joined the protest to demand more financial support from industrialized nations in adapting to climate change. Those from Germany said the country had to turn its back on coal. Germany is seen as a leader in the fight against climate change and the push toward renewable energy but has not yet set a date for phasing out coal, which emits large amounts of CO2 when burned. Coal makes up around 40 percent of the country’s energy mix. As a result, it will likely miss its ambitious 2020 target of reducing CO2 emissions by 40 percent compared to 1990 levels, according to government calculations given to German paper Süddeutsche Zeitung. Unless industrialized states, in particular, phase out coal, environmentalists and scientists say it will be difficult to meet the Paris objectives and avoid catastrophic climate change. Those at the demonstration worried that global leaders might not be up to the task, but remained hopeful. Louise Osborne, Patrick Große and Rebecca Staudenmaier contributed to this report.